I was just hanging out in my garage. We have a window that we can see the feeder through. I noticed this little gal coming in and thought I'd snap a picture with my iPhone. She seemed not to care and to be watching me get closer to the window to get a few more. 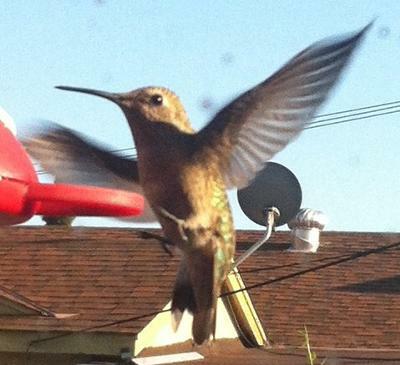 Then all of the sudden, she flew off and then right back onto the feeder. I happened to catch her right as she landed back onto it. I think it's pretty good for an iPhone pic.